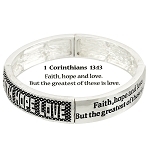 Get inspiration in Your Heart and on your wrist with "You will seek me and find me when you seek me with all your heart." 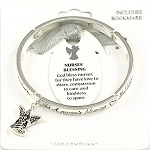 Jeremiah 29:13 inspirational message engraved on this absolutely gorgeous and shiny Stretching Bangle Bracelet with a Fish and a Prayer's Hands Charms, beautifully crafted from four Silver finish metal pieces connected together by a stretching string. Anti-allergic Jewelry, Lead and Nickel compliant.